I’m not the biggest fan of Simon Jenkins, especially when he goes off on one of his childish anti-science rants, but there’s a powerful piece by him in today’s Guardian with which I agree totally. Reading the article on the bus, and especially the passage about the arrival of Huguenot refugees from France in the 18th Century, I decided to repost the content of an item from about 5 years ago, to demonstrate the importance of immigration to Britain’s culture and traditions, sometimes in very surprising ways. Have you ever wondered where and when the traditional “British” dish of fish and chips originated? The answer is fascinating, and a little bit controversial too. The practice of eating fried fish in batter started to appear in England during the fifteenth century; it was derived from the Pescado Frito cooked by Portuguese Sephardic Jews – Marranos – who had moved to Britain to escape persecution in their homeland. By the Victorian era “Fish Fried in the Jewish Fashion” was extremely popular in the working class districts of London, particularly in the East End. Dickens refers to a “fried fish warehouse” in Oliver Twist, which was first published in 1837. It seems to have become available in large quantities with the rapid development of trawler fishing in the mid 19th century. 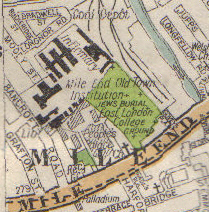 Incidentally, there is a prominent relic of the Spanish and Portuguese Jews who settled in the East End right next to Queen Mary, University of London in Mile End (see left). The burial ground has, I think, recently been moved but it neverthless provides a timely reminder that immigration is by no means a new phenomenon as far as the East End is concerned. The traditional way of frying the fish involved oil and I don’t know precisely when the practice of using lard – which is what is used in many modern shops – came on the scene, but it clearly would not have met with Jewish approval and must have been a more recent development. Some say the practice of frying potatoes like this originated in Belgium or France, and that chips are a British version of pommes frites or french fries. This style of cooking potatoes could have been brought to London by the Huguenots (French Protestants who settled in the East End of London after being forced out of their homeland). However, there is some controversy about how and why chips became so popular throughout Britain. Some claim the practice of eating fried potatoes was already established in the North of England before 1859. It also seems that fried chipped potatoes were served in working class eating establishments throughout Victorian London. Many working people – especially single men living in lodging houses – lacked the facilities or the ability to cook anything substantial at home, so preferred to buy their food ready made. At an Irish Ordinary you could get a filling meal of beer, meat and fried potatoes for about tuppence (in old money). Such establishments proliferated all over London during the 19th Century as the number of navvies and other itinerant Irish labourers grew in response to the demand for manual workers across the country. I think it was most likely the presence of a nearby Irish Ordinary that led a Jewish londoner called Joseph Malin to hit upon the idea of combining fried fish with chipped potatoes. At any rate it’s reasonably well established that the very first commercial Fish-and-Chip Shop was opened by him in 1860 in Cleveland Street and business was so good that it was followed by many others across the East End of London and beyond. There’s something rather inspiring about rediscovering that Britain is nation whose traditions and institutions have always been so reliant on foreign immigrants. Even Fish and Chips turns out to be from somewhere else. This is actually what makes me proud to be British.